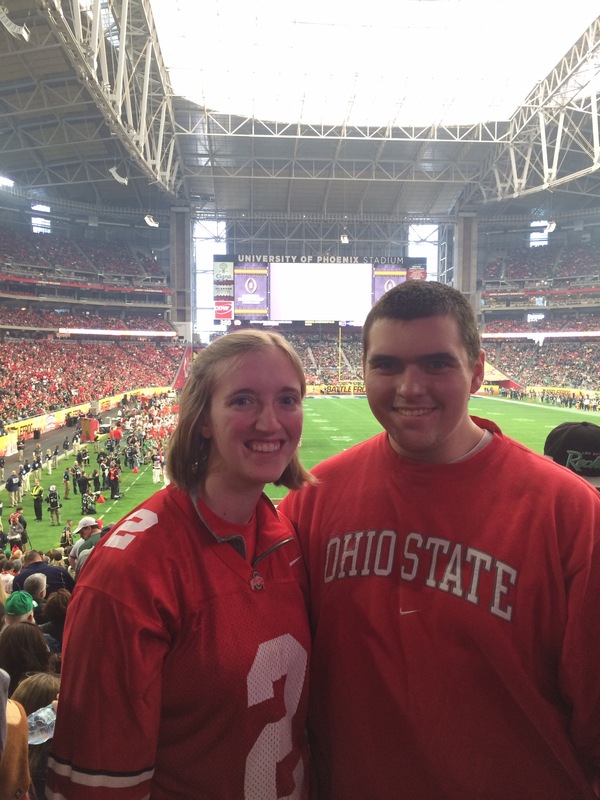 A new college football season just started this past weekend and has me remembering last season when I was lucky enough to go to the Fiesta Bowl in Phoenix, Arizona! So here’s a throwback to that game back in January…. We had already planned our trip to Tucson (flying in and out of Phoenix) when the Fiesta Bowl match-up between The Ohio State University and Notre Dame was announced. The game was on the day we were flying out of Phoenix so we had to go! We got off to a late start that morning and had a little trouble parking with the crowd but got to the game just in time to see Ohio State’s 2nd touchdown of the first quarter right smack dab in front of our seats! I’ve only been to one Ohio State football game before and it was a couple years ago so it took us a second to pick up on the cheers. Basically every time Ohio State ran the ball everyone was shouting in their deepest voice “ZEEEEEEEEEEEEEKE” We joined in and eventually figured out they were cheering for the running back Ezekiel Elliot. One spectator behind us just kept yelling “Feed the Zeke! Feed the Zeke!” And oh boy they did. Elliot finished the game with 149 rushing yards and 4 touchdowns! Oh and that helped Ohio State win 44-28! One of my favorite parts of the game (besides the part where Ohio State won!) was the marching bands’ productions during half time. Notre Dame’s marching band did a tribute to all the branches of the military. They played each branch’s song while spelling out the branch names on the field! Ohio State’s band was a little more elaborate. They did a Back to the Future medley! They recreated different parts of the movie including the DeLorean with flames coming out of the back! We had a great time at the game last January and remembering it now has me ready for fall and football season to start again! 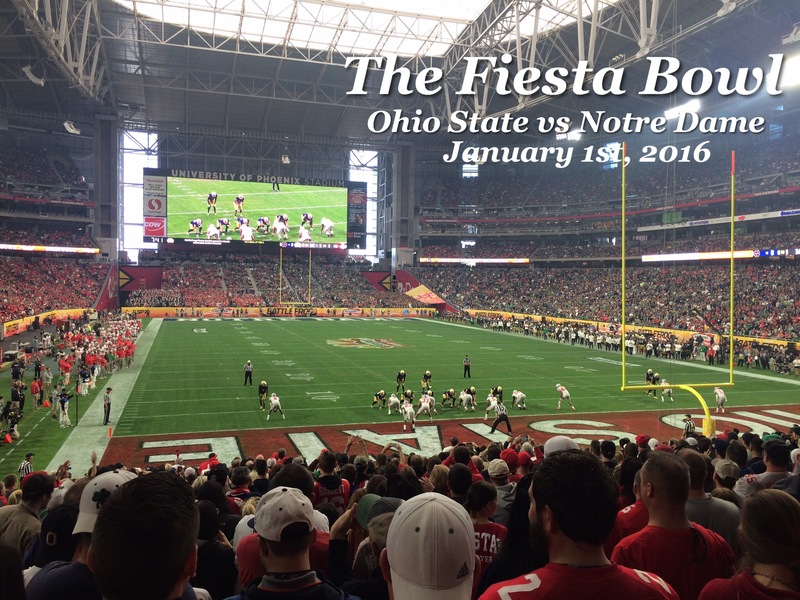 This entry was posted in arizona, Phoenix, Arizona, USA and tagged arizona, college football, Fiesta Bowl, Notre Dame, Ohio State, Phoenix, Schmahl World, Throwback Thursday, travel, travel blog. Bookmark the permalink.